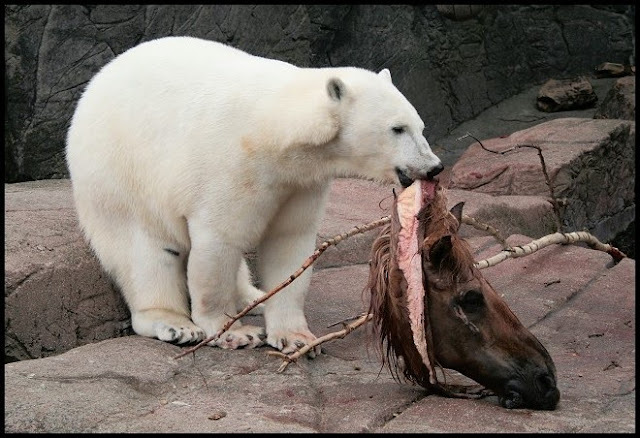 This is very unnatural shot of a polar bear eating a horse's head. Reminds us of the time the lions got fed a horse... in a Zoo. Is this the horse from the Godfather movie? ewwww that is so sick u would have to be a sick minded person to even think of taking the pho DISCUSTING!!!!!! Haha I was in the zoo that day it happenede.Tthe horse was already dead. Was it better to let the head go to waste an kill something in addition to the horse, to feed the icebear?. Nature is rough get out of you sheltered lives.